How cute is this jon jon! !� Custom made once your place your order and pay!� Monogrammed initials on the front with a cute little monkey hanging from the letters!! Monogramming is also included. A name, saying, or initials can be stitched using any color from the design. 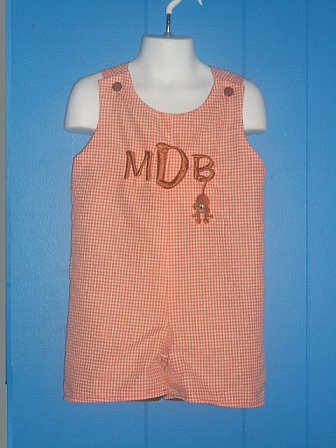 Sizes available are: 6m, 12m, 2T, 3T, and 4. We have lots of designs not listed. If there is something special that you are looking for, please ask. If you would like this outfit in different colors, please ask. We may have the fabric that you are looking for.